In 2010, Labrador defeated Vaughn Ward in the Republican primary 48%–39% on May 10, in what was widely considered a major upset. In the general election, Labrador defeated first-term Democratic incumbent Walt Minnick 51%–41%. Labrador will not be able to run for Idaho's 1st congressional district and governor at the same time; leaving CD-1 an open seat for the 2018 Idaho election. Labrador lives in Eagle, Idaho, with his wife, Rebecca, and their five children. He is a member of The Church of Jesus Christ of Latter-day Saints. ^ "Labrador to run for Idaho governor". POLITICO. Retrieved 2017-09-17. ^ CNN, Eli Watkins,. "Freedom caucus member launches bid for governor". CNN. Retrieved 2017-10-02. ^ "Raul Labrador". Wall Street Journal. Election 2012. November 2012. Retrieved October 6, 2015. ^ "Congressional Biographical Directory of the United States 1774–present". ^ PARKER, ASHLEY and JULIA PRESTON (June 6, 2013). "In House, Immigration Spurs Push by G.O.P". NYT. Retrieved June 7, 2013. ^ "2006 Primary Results legislative". www.sos.idaho.gov. Retrieved 2017-04-10. ^ "2006 General Results legislative". www.sos.idaho.gov. Retrieved 2017-04-10. ^ "2008 Primary Results legislative". www.sos.idaho.gov. Retrieved 2017-04-10. ^ "2008 General Results legislative". www.sos.idaho.gov. Retrieved 2017-04-10. ^ a b "Conservative Labrador quits House immigration group". The HIll. Retrieved 5 June 2013. ^ "Following town hall backlash, Labrador says health care comment 'wasn't very elegant'". idahostatesman. Retrieved 2017-05-08. ^ a b Russell, Betsy Z. "Little speaks out on health care, Labrador on abortion; Ahlquist brings tour to North Idaho". Spokesman.com. Retrieved 27 December 2017. ^ Percelay, Rachel (July 28, 2015). "The "First Amendment Defense Act" Is The Next Attack on LGBT Rights". Media Matters. Retrieved December 18, 2015. ^ Guilhem, Matt. "Idaho Congressman Raul Labrador Holding Two Town Halls". Retrieved 2017-10-02. ^ a b Russell, Betsy Z. "Labrador, Simpson laud GOP tax bill as it passes House". Spokesman.com. Retrieved 27 December 2017. ^ "Conservatives Form Their Own Caucus Because the RSC Isn't 'Hard-Core' Enough". National Journal. Retrieved 2017-05-12. ^ "9 Republicans launch House Freedom Caucus". POLITICO. Retrieved 2017-05-12. ^ Kruesi, Kimberlee (April 20, 2017). "Idaho GOP Congressman Faces Angry Crowd at Town Hall". US News & World Report. Associated Press. Retrieved May 3, 2017. I do not believe health care is a basic human right," Labrador said to jeers while answering a question about health care reform and increasing costs. "I just don't think it's a right to have health care. ^ Savransky, Rebecca (April 20, 2017). "GOP rep booed at town hall for saying healthcare isn't a 'basic human right'". The Hill. Rep. Raúl Labrador (R-Idaho) faced boos from a town hall audience while defending his views that healthcare is not a "basic human right." "I just don't think it's a right to have healthcare," Labrador said Wednesday in response to a question about healthcare reform and increasing costs, according to The Associated Press. ^ Barnhill, Frankie (April 20, 2017). "Labrador Pushed On Health Care, Russia And Trump's Taxes During Town Hall". KBSX. Boise State Public Radio. Retrieved May 10, 2017. So no I do not believe that health care is a basic right," says Labrador. "When something is a right it's something that must be provided by the government. ^ http://www.washingtontimes.com, The Washington Times. "Raul Labrador: GOP health care bill 'has no natural constituency'". The Washington Times. Retrieved 2017-04-22. ^ "Americans don't want mass deportations but are sort of OK with increased deportations", washingtonpost.com; accessed November 15, 2014. ^ Ysursa, Ben. "May 23, 2006 Primary Election Results: Legislative Totals". Boise, Idaho: Secretary of State of Idaho. Retrieved February 26, 2017. ^ Ysursa, Ben. "November 7, 2006 General Election Results: Legislative Totals". Boise, Idaho: Secretary of State of Idaho. Retrieved February 26, 2017. ^ Ysursa, Ben. "May 27, 2008 Primary Election Results: Legislative Totals". Boise, Idaho: Secretary of State of Idaho. Retrieved February 26, 2017. ^ Ysursa, Ben. "November 4, 2008 General Election Results: Legislative Totals". Boise, Idaho: Secretary of State of Idaho. Retrieved February 26, 2017. ^ Kraushaar, Josh (2010-05-26). 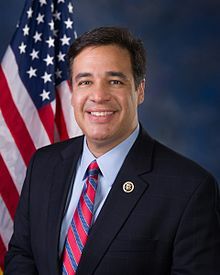 "Rep. Raul Labrador wins Idaho primary upset". Politico. Retrieved 2010-06-28. ^ "Idaho's Labrador, late to endorse in 2012 presidential race, jumps in early to support Rand Paul". idahostatesman. Retrieved 2017-04-10. ^ "Mitt Romney: Press Release: Rep. Raul Labrador: We Need Mitt Romney In Washington". www.presidency.ucsb.edu. Retrieved 2017-04-10. ^ Helfrich, Jesse (2012-04-18). "GOP leaders endorse Mitt Romney, seek party unity behind probable nominee". TheHill. Retrieved 2017-04-10. ^ Labrador decides not to challenge Otter for governorship of Idaho, politico.com; accessed November 15, 2014. ^ "Rep. Raul Labrador To Seek Re-Election, Ends Speculation About Run For Governor". Fox News. August 14, 2013. ^ Shirley Ringo challenges Labrador for congressional seat, m.lmtribune.com; accessed November 15, 2014. ^ Cornwell, Jane (June 13, 2014). "Republican Rep. Labrador running for House majority leader post". Reuters. Retrieved June 17, 2014. ^ "Statewide Totals". www.sos.idaho.gov. Retrieved 2017-04-10. ^ "Another congressman – Labrador – backs Trump's policies, not his rhetoric | McClatchy Washington Bureau". www.mcclatchydc.com. Retrieved 2017-04-10. ^ "Rep. Raúl Labrador: Would Be 'Hard' But I'd Support Trump if GOP Nominee". Newsmax. Retrieved 2017-04-10. ^ "Rep. Raul Labrador joins Idaho governor's race". AP News. Retrieved 2017-05-09. ^ Press, KIMBERLEE KRUESI Associated. "Labrador officially kicks off Idaho gubernatorial campaign". Idaho Press-Tribune. Retrieved 2017-06-08. ^ "'Unleash the raw potential'". 2017-06-01. Retrieved 2017-06-08. ^ Davis, Taja (2017-06-01). "Raul Labrador's stop in eastern Idaho to campaign for governor". KIFI. Retrieved 2017-06-08. ^ "Labrador hasn't won VanderSloot's endorsement". Spokesman.com. Retrieved 2017-06-20. ^ Almukhtar, Sarah (2018-05-15). "Idaho Primary Election Results". The New York Times. ISSN 0362-4331. Retrieved 2018-05-21. Wikimedia Commons has media related to Raúl Labrador.